Episode #389 Part IV: Superman Comic Book Cover Dated November 1965: Action Comics #330! Action Comics 330, November, 1965! Download Episode 389 Part IV! ACTION COMICS 330, November 1965, was published on September 30, 1965 (three days after my fifth birthday). It contained 32 pages for the cover price of 12¢. Mort Weisinger was the editor, and the cover was pencilled by Curt Swan, inked by George Klein and lettered by Ira Schnapp. It featured the Supergirl story at the back of the issue. - (3:28) MY PULL LIST featuring the comic books released during the month of March 2019, which carried the cover date of May 2019, that I received from Discount Comic Book Service. - (15:18) THE STRANGE "S" SPELL ON SUPERMAN (12 pgs. ), written by Edmond Hamilton, pencilled by Curt Swan, inked by George Klein and lettered by Joe Letterese. - (37:34) METROPOLIS MAILBAG letter column, covering two pages in this issue. - (47:15) SUPERGIRL'S DUEL WITH DR. SUPERNATURAL (12 pgs. ), written by Leo Dorfman, drawn by Jim Mooney and lettered by Milt Snappin. - (1:01:18) ELSEWHERE IN DC COMICS, 30 titles carried the November or November/December 1965 cover date, according to Mike's Amazing World Of DC Comics. Beginning next episode we will feature: SUPERMAN FAMILY COMIC BOOK COVER DATED DECEMBER 1965: PART I: SUPERMAN'S PAL JIMMY OLSEN 89, PART II: THE BRAVE AND THE BOLD 63 (starring Supergirl and Wonder Woman), PART III: ACTION COMICS 331 & PART IV: WORLD'S FINEST COMICS 154! 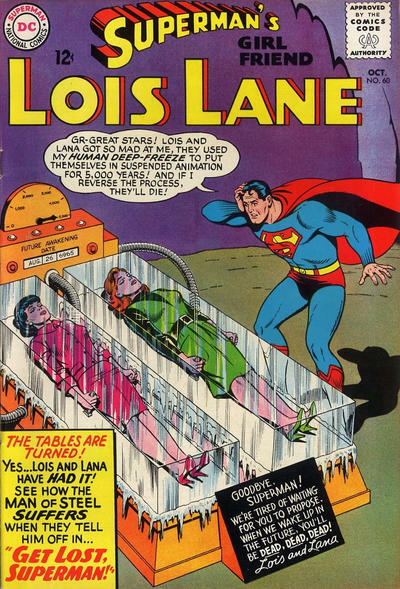 Episode #389 Part III: Superman Family Comic Book Cover Dated November 1965: Superman's Girl Friend Lois Lane #61! Superman's Girl Friend Lois Lane 61, November 1965! Download Episode 389 Part II! SUPERMAN'S GIRL FRIEND LOIS LANE 61, November 1965, was published on September 23, 1965 (four days before my fifth birthday). It contained 32 pages for the cover price of 12¢. Mort Weisinger was the editor, and the cover was drawn by Kurt Schaffenberger, who was also the artist on both stories in this issue. The letterer was Ira Schnapp. 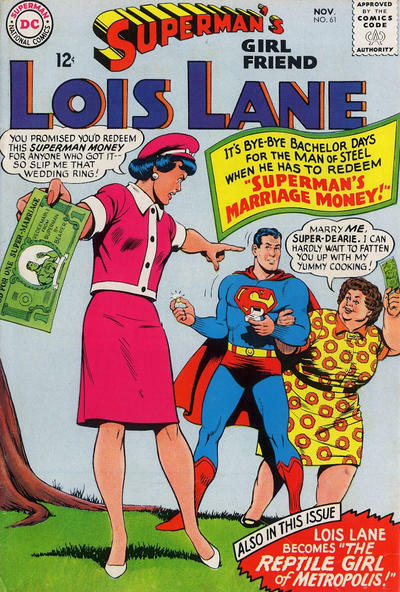 - (8:42) SUPERMAN'S MARRIAGE MONEY (8 pgs. ), written by Otto Binder and lettered by Milt Snappin. - (27:22) THE REPTILE GIRL OF METROPOLIS (16 pgs., divided into two eight page parts), written by Leo Dorfman and lettered by Vivian Berg. This story was reprinted in SUPERMAN'S GIRL FRIEND LOIS LANE 114, September 1971, released on July 22, 1971. It contained 48 pages for the cover price of a quarter. E. Nelson Bridwell was the editor. - (36:47) PART II: THE SECRET OF THE REPTILE GIRL. - (52:43) LETTERS TO LOIS column. Next Episode: SUPERMAN COMIC BOOK COVER DATED NOVEMBER 1965: PART IV: ACTION COMICS 330! At the end of the episode we will look at the other DC Comics titles that carried the November or November/December 1965 cover date. Then we will cover: SUPERMAN FAMILY COMIC BOOKS COVER DATED DECEMBER 1965: PART I: SUPERMAN'S PAL JIMMY OLSEN 89, PART II: THE BRAVE AND THE BOLD 63 (starring Supergirl and Wonder Woman), PART III: ACTION COMICS 331 & PART IV: WORLD'S FINEST COMICS 154! Episode #389 Part II: Superman Comic Book Cover Dated November 1965: Superman #181! 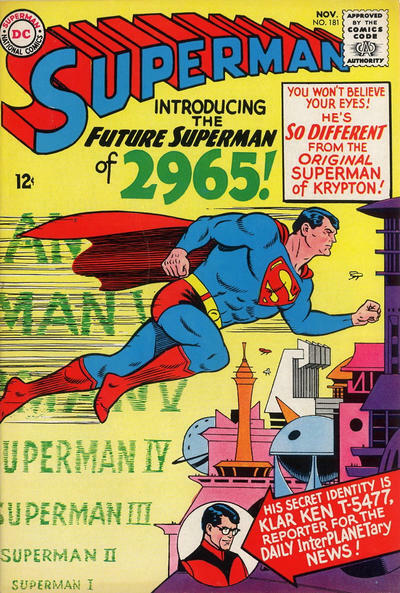 SUPERMAN 181, November 1965, was published on September 16, 1965 (eleven days before my fifth birthday). It contained 32 pages for the cover price of 12¢. 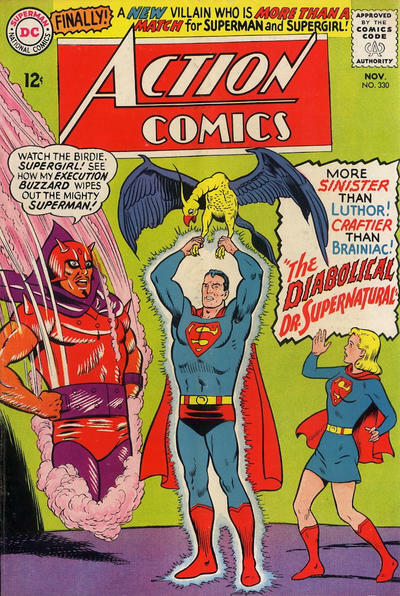 Mort Weisinger was the editor, and the cover, featuring the issue's second and final story, was pencilled by Curt Swan and inked by George Klein, the art team for both stories in this issue. The cover was lettered by Ira Schnapp. - (5:18) THE SUPER-SCOOPS OF MORNA VINE (16 pages divided into two 8-page parts), written by Leo Dorfman. - (22:58) Part II: THE SECRET OF THE NEW SUPERGIRL. - (47:04) METROPOLIS MAILBAG letter column. - (54:41) THE SUPERMAN OF 2965 (8 pgs. ), subtitled The First Of A New Series, was written by Edmond Hamilton. This story was reprinted in SUPERMAN 244, November 1971, released on September 16, 1971, exactly six years to the day after this story was originally published. It was also reprinted in SUPERMAN: PAST AND FUTURE. Next Episodes: SUPERMAN FAMILY COMIC BOOKS COVER DATED NOVEMBER 1965: PART III: SUPERMAN'S GIRL FRIEND LOIS LANE 61 & PART IV: ACTION COMICS 330! Then we will feature: SUPERMAN FAMILY COMIC BOOKS COVER DATED DECEMBER 1965: PART I: SUPERMAN'S PAL JIMMY OLSEN 89, PART II: THE BRAVE AND THE BOLD 63 (starring Supergirl and Wonder Woman), PART III: ACTION COMICS 331 & PART IV: WORLD'S FINEST COMICS 154! Episode #389 Part I: Superman Family Comic Book Cover Dated November 1965: World's Finest Comics #153! World's Finest Comics 153, November 1965! Download Episode 389 Part I! 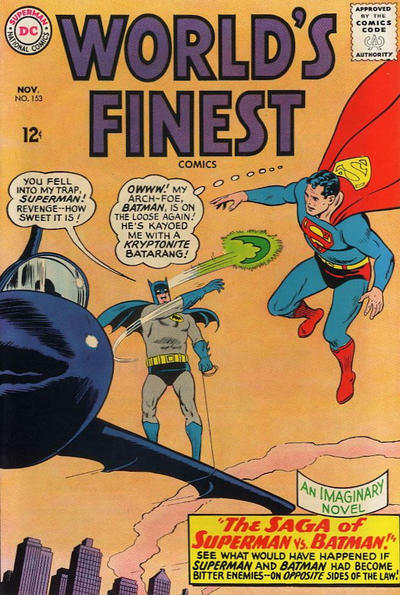 WORLD'S FINEST COMICS 153, November 1965, was published on September 9, 1965. It contained 32 pages for the cover price of 12¢. Mort Weisinger was the editor, and the cover was pencilled by Curt Swan. According to Mike's Amazing World Of DC Comics, George Klein was the inker, while the Grand Comic Book Database credits Sheldon Moldoff as the inker. This cover was lettered by Ira Schnapp. - (9:16) THE CLASH OF CAPE AND COWL (16 pgs, Part I is 9 pgs. long), plotted by Cary Bates, according to Mike's Amazing World Of DC Comics, written by Edmond Hamilton, pencilled by Curt Swan and inked by George Klein. This was the first Imaginary Story to appear in this series, and the 20th Imaginary Story we've covered on the podcast. - (23:26) PART II: THE DEATH OF A HERO (7 pgs.). - (43:52) CAPE AND COWL COMMENTS letter column. - (55:05) THE BOY WHO CHANGED THE FUTURE (6 pgs. ), the second installment of the EDITOR'S ROUND TABLE, where DC editors chose past stories to reprint. This story was written by John Broome, pencilled by Bob Oksner, inked by Bernard Sachs and lettered by Gaspar Saladino. It was originally published in STRANGE ADVENTURES 21, June 1952. The issue contained 32 pages for the cover price of a dime, and the editor was Julius Schwartz. Next Episodes: SUPERMAN COMIC BOOKS COVER DATED NOVEMBER 1965: PART II: SUPERMAN 181, PART III: SUPERMAN'S GIRL FRIEND LOIS LANE 61 & PART IV: ACTION COMICS 330! Episode #388 Part V: Superman Family Comic Book Cover Dated October 1965: Superman's Pal Jimmy Olsen #88! Superman's Pal Jimmy Olsen 88, October 1965! Download Episode 388 Part V! 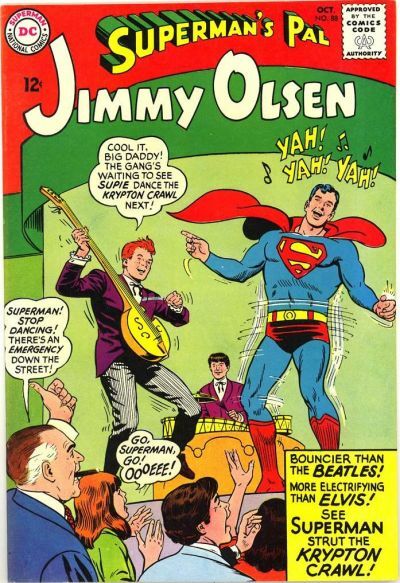 SUPERMAN'S PAL JIMMY OLSEN 88, October 1965, was published on August 26, 1965. It contained 32 pages for the cover price of 12¢. Mort Weisinger was the editor, and the cover was pencilled by Curt Swan and inked by George Klein, according to Mike's Amazing World Of DC Comics, while the Grand Comic Book Database credits Sheldon Moldoff as the inker. - (2:55) MY PULL LIST featuring the comic books cover dated April 2019 and released during the month of February, which I received from Discount Comic Book Service. - (13:10) THE SWINGING SUPERMAN (8 pgs. ), written by Otto Binder, pencilled by Curt Swan, inked by George Klein and lettered by Milt Snappin. - (29:45) JIMMY OLSEN'S PEN PALS letter column. - (37:36) THE RIDDLE OF THE OLSEN STATUE (8 pgs. ), written by Jerry Siegel, drawn by George Papp and lettered by Vivian Berg. - (51:15) JIMMY OLSEN, WORLD'S HEAVYWEIGHT CHAMPION (8 pgs. ), written by Otto Binder, pencilled by John Forte, inked by Sheldon Moldoff according to Mike's Amazing World Of DC Comics, while the Grand Comic Book Database credits George Klein as the inker. The story was lettered by Ira Schnapp. - (1:04:58) Elsewhere in DC Comics, 32 titles carried the October or October/November 1965 cover date, according to Mike's Amazing World Of DC Comics. Next Episodes: SUPERMAN FAMILY COMIC BOOKS COVER DATED NOVEMBER 1965: PART I: WORLD'S FINEST COMICS 153, PART II: SUPERMAN 181, PART III: SUPERMAN'S GIRL FRIEND LOIS LANE 61 & PART IV: ACTION COMICS 330! Episode #388 Part IV: Superman Comic Book Cover Dated October 1965: Action Comics #329! Action Comics 329, October 1965! Download Episode 388 Part IV! ACTION COMICS 329, October 1965, was published on August 28, 1965. It contained 32 pages for the cover price of 12¢. Mort Weisinger was the editor, and the cover was pencilled by Curt Swan. According to Mike's Amazing World Of DC Comics George Klein was the inker, while the Grand Comic Book Database credits Sheldon Moldoff as the inker. This cover was lettered by Ira Schnapp. 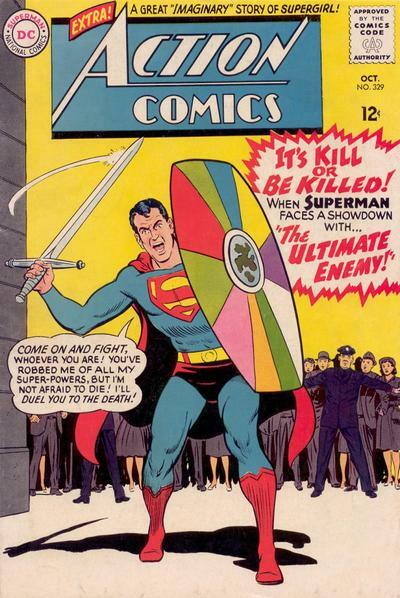 - (4:48) Superman starred in THE ULTIMATE ENEMY (12 pgs. ), written by Edmond Hamilton and drawn by Al Plastino. - (22:18) METROPOLIS MAILBAG letter column. - (31:36) The Supergirl story was titled DRANG THE DESTROYER (12 pgs. ), written by Leo Dorfman and drawn by Jim Mooney. This story was also reprinted in SUPERGIRL: THE SILVER AGE OMNIBUS vol. II. Next Episode: SUPERMAN FAMILY COMIC BOOK COVER DATED OCTOBER 1965: SUPERMAN'S PAL JIMMY OLSEN 88, with the feature, ELSEWHERE IN DC COMICS! Then we will begin to cover: SUPERMAN FAMILY COMIC BOOKS COVER DATED NOVEMBER 1965: PART I: WORLD'S FINEST COMICS 153, PART II: SUPERMAN 181, PART III: SUPERMAN'S GIRL FRIEND LOIS LANE 61 & PART IV: ACTION COMICS 330! Episode #388 Part III: Superman Family Comic Book Cover Dated October 1965: Superman's Girl Friend Lois Lane #60! Superman's Girl Friend Lois Lane 60, October, 1965! SUPERMAN'S GIRL FRIEND LOIS LANE 60, October 1965, was published on August 12, 1965. It contained 32 pages for the cover price of 12¢. Mort Weisinger was the editor, and the cover was drawn by Kurt Schaffenberger, who was also the artist for all three eight page stories in this issue. Ira Schnapp was the letterer. - (7:50) LOIS LANE'S GREATEST RIVAL, writer unknown. This story was subtitled A NEW IMAGINARY STORY, the 14th Imaginary Story we've covered for the podcast. - (31:50) THE AMAZING HYDRO-GIRL, written by Otto Binder and lettered by Milt Snappin. This story was reprinted in SUPERMAN FAMILY 167, October/November 1974, released on July 25, 1974. This issue contained 100 pages for the cover price of 60¢. - (48:00) LETTERS TO LOIS column. - (54:48) GET LOST, SUPERMAN, also written by Otto Binder and lettered by Milt Snappin. Next Episode: SUPERMAN COMIC BOOK COVER DATED OCTOBER 1965: PART IV: ACTION COMICS 329 & PART V: SUPERMAN'S PAL JIMMY OLSEN 88! Then we will cover: SUPERMAN FAMILY COMIC BOOKS COVER DATED NOVEMBER 1965: PART I: WORLD'S FINEST COMICS 153, PART II: SUPERMAN 181, PART III: SUPERMAN'S GIRL FRIEND LOIS LANE 61 & PART IV: ACTION COMICS 330!